Traditional Indian dresses are always in greater demand. Women prefer Indian outfits during festival season. Now a day’s most women prefer choosing Indowestern dresses and Kurtas for various events. It is because they add fusion to regular Indian traditional clothes. Fancy designer Indian indo western party wear dresses are hot for buying; women do it via online shopping. The Indo-western designs will have full or short sleeves. The Kurtas and salwar remain shorter and resemble a western style. Professionals prefer wearing western styles to the office. Fashionable women can get Indowestern such as Attires with jeans, pant, and trousers. Today a huge range of latest fashion trends Indo Western outfits designs is handy for online shopping. Long gowns are growing importance among Indian women. For formal events, many women prefer buying long party wears. Those are a perfect choice for marriage, reception, parties, formal dinners & other occasions. You will find a wide range of long outfits and churidar online that can attire for different events. Are you looking to buy a stylish long salwar kameez suit for a party? You must search through a various website of famous designers. Many of them offer year-end and festival sale, which is the right time to buy Indo Western Garments at a cheap rate. 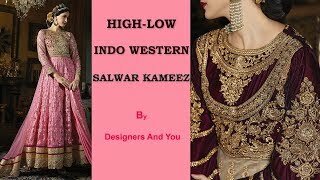 Indowestern fashion is a blend of Indian and western style. Chic western fashion has influenced Kurtis. You may pair them with trousers, pants, palazzos & full-length skirts. Many Bollywood actresses prefer wearing Indo-western suits for fashion shows and night parties. Here are some references to latest branded Indowestern clothing, you may try out. Now International ensembles come with the traditional twist. These indo-western Attires will make you look smart and updated. It makes a perfect choice for night parties and dinner. The uniqueness of the design will make you look stunning. The tail cut kurtis will make you look like a "BLUE RIBBON". Make sure you include the design this summer in your wardrobe. Vivid bright colors will make you look attractive. Bollywood beauties & Indian models have made the Indo Western ensemble a style statement. The mix and match patterns are an Indo Western fusion, and it includes a saree style wrap-around skirt paired with a top. You may get party-wear Indian dresses for marriage, Sangeet, reception or family get-together. The asymmetric Indo Western top with pants makes a good choice for a social event. The top can be team up with flip-flops. New Indo Western suits design for ladies are well known for richness and elegance. Floor length dresses are the most preferred Dress among Indian women’s. They are a trend now, and you may wear them for events, operas, themed parties and various occasions. You may prefer buying stylists floor-length outfit & long churidar for the wedding party. The fashionable dress remains a blend of traditional and western fashion trends. Floor length garments are available in a variety of design, style, and fabric. Many Bollywood personalities put-on chic suits for film premier and award functions. Fusion outfits are available which will make you look gorgeous on a special occasion. Indo Western suit can impress everyone at a wedding. You need to pick them up that suit to your body type. A Pair of churidar and the long floor-length top is the best ensembles for tall girls with a curvaceous body. You may pair them with palazzo pants. You can pair Anarkali with well-fitted bottoms like churidar or leggings. If you have an apple-shaped body, you must avoid fabrics that fit your body. Choose fabrics like silk and cotton. Team up high hills with Long and flared salwar kameez but those shouldn’t be too tight and too loose. Fashion is not an easy thing to follow and predict. The style and pattern of exclusive brands change according to weather. Staying trendy is always expensive, but some low priced outfits you must add to the wardrobe. 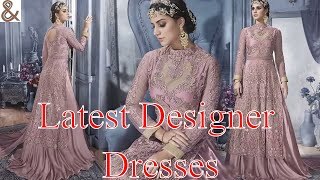 If you are looking to buy branded ensembles on a budget, you must prefer some best indo western ethnic party wears dresses online. Today, many Boutiques' offer sophisticated and ultra-modern designs of Sarees, Anarkalis, Churidar & Lehengas. They offer bridal wear as well as regular Indian Indo Western outfits. Since a lot of women prefer buying, Indian dresses from boutiques because they get cheap and best shopping. They keep on updating their collection. Indian fabric and textile are popular and has a greater demand in India as well as International. Designed outfits are quite expensive, but still, women prefer buying them for special occasion and marriages. There are some reputed fashion designers in India like Tarun Tahiliani & Rohit Bal. We can also consider Manish Arora, J J Valaya, Rina Dhaka, Ritu Beri, Ritu Kumar & Manish Malhotra. Leading actresses from the film industry prefer wearing their costume. The design, style, and pattern will remain new, and others will dictate the style. Now finding new fashion's stylish & best designer indo western clothes is not a tough job for women. Inventor's Western clothes are well known for creative style and uniqueness. Today these types of fancy clothes are easy to buy from branded online stores. Choosing dresses for a party is always a difficult task when many styles and choices are handy. Trendy outfits are available online from originators around the world. Before buying one, you must consider the formality of the occasion. The body shape and skin tone determines the best style as well as color for a party dress. You must be careful while choosing accessories to pair with your Attire. You may choose fabrics like satin, silk or glossy synthetic fabric for a formal event. Neutral colors remain versatile and suitable for different events. A modern black outfit is enough for most events. You may prefer wearing a floor-length evening dress for formal events and marriages. Knee length outfits are suitable for casual parties. For cocktail parties, you may choose semi-formal. Warm-toned complexion looks great in yellow, red and brown colored outfits. Women having a pear-shaped figure should choose A-line outfits. They may have square, cowl and boat neckline. Apple figures must choose short outfits and skirts. They may buy party-wear with solid colors rather than prints. Hourglass figures may choose Pakistani A-line dress; wrap outfits and high waist styles. Stylish & modern women's Indian designer fancy palazzo style party wears salwar kameez pant-suits designs are in a rage. Palazzos are the latest trend; most Kurtas are now available to pair with printed palazzo. They are available in different color, silhouettes, and ethnic work pattern. The suit will have a high slit, and you may put on it with high heels. A blend of traditional & western fashion remains an excellent choice for any occasion. Indians residing abroad prefer wearing such dresses on festive occasion. You must consider few factors if you are looking to buy a chick dress Indo western suit. Consider skin tone, body type & budget to choose a perfect outfit for an upcoming festivity. There are various types of Indian salwar kameez available for the different occasion. In India, women put on the dresses as casual as well as for wedding ceremonies. Churidar plays an important role in Indian culture and society. There are various types of designer salwar kameez available for the different occasion. In India, women put on the outfit as casual as well as for wedding ceremonies. Churidar plays an important role in Indian culture and society. The ethnic dress fits women of all figure type. Here are some best stylish salwar suits designs suitable for parties. indo-western Anarkali suits and Kurtas are available in different material, color, and style. They are available in short, medium and floor length. Fashionable wear comes with heavy embroidery. They come in rich colors making suitable for weddings, reception and night events. Compliment them with high heels, ethnic earrings, and bangles. Bollywood actresses love the traditional Punjabi fashion wears. The freestyle attire consists of a traditional skirt and kameez. If you like long kameez with Brocade & floral prints patterns, go for branded Punjabi Lehenga style suit.